Developed primarily for road-driving, the BMW X5 is the sporty choice among SUVs. It is fast, comfortable, and offers superb handling and strong performance from Inline-6 and V8 engines. 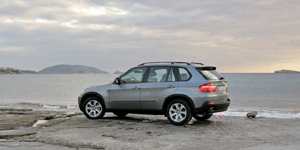 The BMW X5 was completely redesigned for 2007 and now features seating for up to seven. Thanks to new six-cylinder and V8 engines mated to a revised six-speed automatic transmission for 2008, the X5 remains one of the best performance-oriented vehicles in its class. Find the used BMW X5 of your choice from a dealer in your area. Search our used car listings now.